Tonight's manicure is a simple little gradient. I used Heavenly (Savina) and Crown Me Already! (OPI). If you want to get this same effect, check out my tutorial here. Though it's simple, it's in preparation for a class reunion. Which class? 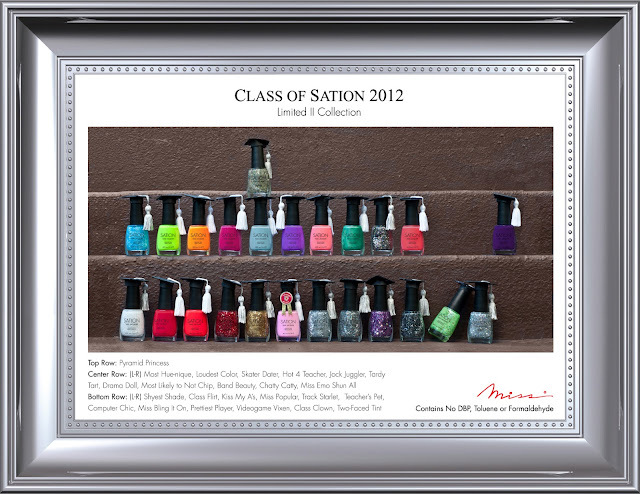 Miss's Sation Limited II Collection, Class of Sation. Adorable photo, with some adorable polishes accompanying it. Stay tuned, swatches of the classmates will be up in the next day or two! This is SUPER feminine and elegant - love it! Ooh this is so lovely. This is very pretty!~ Reverse glitter gradients are so delicate and always look good and you "nailed it" perfectly! Loving your mani :D So simple and classy! lol that picture is adorable!